AI in E-commerce: Boon or Bust? 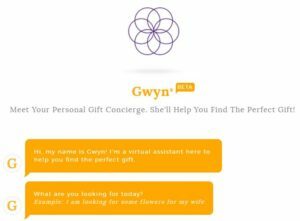 1-800-Flowers.com launched Gwyn (a.k.a. Gifts When You Need Them). Within two months, 70% of online orders were completed through GWYN. See learnings. North Face’s conversational engine has the potential to run tens of thousands of consumers through its Q-and-A interface. 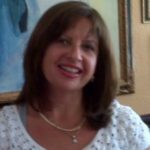 But what does the future look like for AI in e-commerce? SLI set out to answer this question by asking more than 200 e-commerce professionals in its third quarterly 2017 E-commerce Performance Indicators and Confidence Report. The responses were revealing. 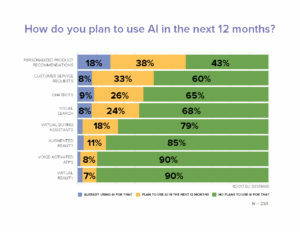 While more than half (54%) have already implemented or plan to add AI in the future – including 20% who expect to add AI within the next 12 months – there remain substantial opportunities for growth and education in AI. 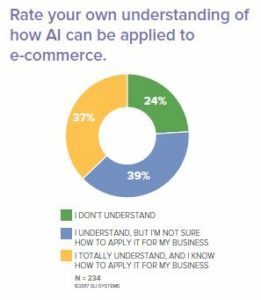 About a quarter (24%) reported not understanding how AI can be applied to e-commerce at all, and more than one-third (39%) said that while they understand AI’s e-commerce applications, they weren’t sure how it applied to their specific business. These responses reveal a huge opportunity for online retailers to learn about emerging and existing AI applications that improve CX and the bottom line. When asked how they’re using or planning to use AI, retailers reported the most-popular applications slated for implementation within the next 12 months were Personalized Product Recommendations (57%), Customer Service Requests (40%) and Chatbots (35%). However, not all AI apps are popular on the e-commerce front – Virtual Reality and Voice-Activated Apps (90% each), Augmented Reality (85%) and Virtual Buying Assistants (79%) all had large percentages of respondents expressing no plans to use them in their businesses, now or in the future. Not surprisingly, VR and AR headset shipments are also experiencing slower growth than expected. Cross analysis by geographical region exposes where AI is hot and where it’s been placed on the back burner. In the top three regions surveyed, current AI use is most prevalent in the U.S, with 17% of U.S-based respondents reporting it is already in use. This is closely followed by the the AU-NZ region (15%) and the UK (14%). However, retailers in the UK report the most aggressive plans for implementing AI with one-third (33%) expecting to leverage it within the next year, followed by the U.S. (17%) and the AU-NZ regions (15%). In line with the cases and findings above, McKinsey uncovered that companies invested $26B to $39B in AI in 2016 and PwC found 72% of business decision makers believe AI will be the business advantage of the future. Without a doubt, the AI revolution is poised to be a boon for retailers.